If use of cosmetics is any indication of vanity, there's plenty to go around. Stores are full of products to beautify the body; including skin, hair, nails and lips. 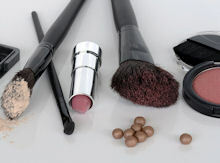 Creams, toiletries, and makeup designed to change or camouflage are all examples of cosmetics. Today, cosmetics are not only acceptable, they're widely accepted for modern women. How they're used and applied is what separates those who look silly from those who look beautiful and sophisticated. We'll outline some cosmetics tips to help you bring out your best features while concealing your flaws and problem areas. Think of your skin as a canvas. The better the canvas, the better the art, no? There's no denying that genes play a crucial role in your overall appearance, but skin care early on in life will definitely give you the edge when it comes to texture, lines and spots when you hit your thirties and beyond. Introduce cosmetics one at a time and test behind your ears or on your forearm if you have sensitive skin. Hypoallergenic products are least likely to cause skin irritation. Body lotions add comfort to dry skin while adding luster. Hands are often exposed to sunlight and may show age much quicker. We don't always pay attention to our hands but others do. Keep your hands soft and silky by using hand lotion multiple times every day, particularly after washing them and before bed. In pre-teen and teen years it's important to keep skin clean and as clear as possible from blemishes to prevent scarring. Combination skin calls for treating problem areas accordingly. As we age, our skin loses it's moisture and elasticity. There are various facial creams on the market today to add much-needed moisture to our faces and reduce fine lines and wrinkles, thus improving our "canvas." When it comes to cosmetics, makeup is the the fun part. Applying makeup is a learned art. Always opt for cosmetics brushes that are high quality to ensure that they're effective and can withstand frequent washings. Start by putting on foundation with a sponge, blending it from the center, outwards, into the hairline and neck. Cover your eyelids and lips as well for solid base. You can set your foundation with loose powder and a large cosmetics brush. Apply eye shadow to enhance your eyes. Three shades are ideal to shape and define with the darkest color on the lid and the lightest just beneath the brow bone. Mascara lengthens lashes provides fullness. Blush adds color to cheeks and a youthful glow to your nose forehead and chin. Bronzing powder can double as blush and can be used for shading or hide a double-chin. Blend in well for a more natural look. Define luscious lips with a lip liner similar to your own lip color or one that matches the color of your lipstick. To create fullness, dust on some white eye shadow to the center of your bottom lip. Keep lips moisturized at night with lip balm or traditional petroleum jelly. In the sunlight, use balm with a SPF to block the sun's dangerous rays from damaging your precious puckers.